What is an Income-Producing Activity? When you’re running your business, it’s easy to get bogged down on the day-to-day grind and not focus on activities that are truly producing income for your business. You can feel very busy at the end of your office day, but when you look back, you feel like you’ve done nothing. You might feel very busy but are not actually being very productive in terms of producing progress or income for your business. As a home design & service professional, your first priority should always be prospecting and bringing clients into your sales cycle. Basically, you want to focus on activities in your business that make you money. Busy-work like paperwork, data entry, restocking stuff in the warehouse, etc. can be outsourced to your assistants while you focus on getting more business. Make sure you have strong and professional branding for your business. This includes all your marketing materials, such as business cards, website, etc. Call prospective clients and ask them out for coffee or a quick chat on the phone. Go to open houses and meet agents you want to work with. Co-host an open house at one of your staged homes. Make presentations at your local Realtor’s Association. Make presentations at real estate offices. Co-host a seller’s seminar with a seller’s agent. Search for a list of expired listings or homes that are not selling in your area. 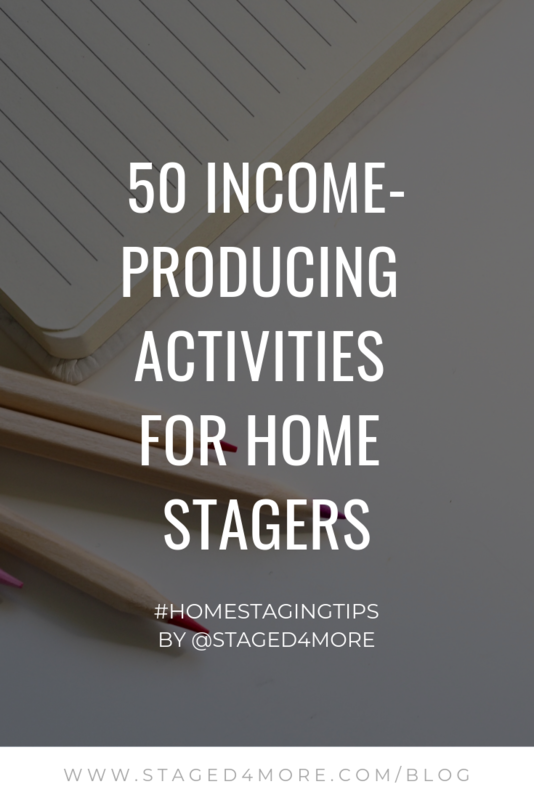 Approach those agents & sellers and convince them to stage the home. Tell all your friends about your business and what kind of referrals you’re looking for. Write free articles for your local newspapers and/or real estate blogs. Talk to other real estate professionals like photographers and team up and prospect for businesses together. Do an open house/luncheon at your warehouse space for your existing and prospective clients. Send out “Just Staged & Sold!” postcards regularly out to your pool of existing and prospective clients. Create virtual tours and videos of your staged properties and share them on all your social networks. Create a newsletter that you send out regularly to keep in touch with clients. Make sure you’re listed in all the free online listings, like Yelp, Free Google Business Listing, Houzz, etc. Advertise in the weekly tour sheets of your local Realtor’s Associations. Get involved at your local Realtor’s Association. You can become an affiliate, host events, teach at your association, etc. Call existing clients who haven’t booked you for awhile and get in touch. Host networking or education events for real estate professionals and network. Because you are the host, you’re the center of attention and people will remember you. Write blog posts that are educational to the home sellers and agents for your website. For every home you’ve staged, write a case study that talks about the project, what you did, and share before and after photos. Send handwritten cards to clients. Ask for testimonials from clients (written, video, etc.). Make sure your website is easy to navigate, especially for potential clients to call you to book an appointment. Make promotional items with your company branding on them. In my personal experience, pens, hand sanitizers, and Post-Its are the most popular. Put out business cards and marketing materials at your staged listings. Come up with scripts to answer common frequently asked questions or common client objections. Interact with clients on social media. Work on SEO (Search Engine Optimization) to make sure your website ranks high when people search for home staging company in your area. Send clients handwritten thank you notes once a staging project has wrapped. Make behind the scenes videos to share on your website or social media. Take on a leadership positions at your local Realtor’s Associations. Get involved with a charity that you’re passionate about. You can meet a lot of prospects that way organically. Go to real estate conferences to network, meet, and learn from other real estate professionals. Invest in professional photos for your portfolio and your professional headshot. Design a client experience that you’ll want to have if you were your client. Reach out to clients who have outstanding bills with you. 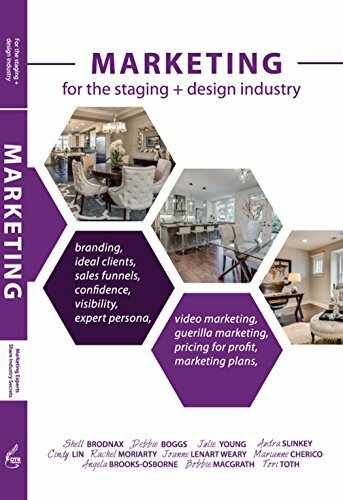 Write a guide on home staging and give it away for free on your website in exchange for their email addresses to grow your email list. Post project photos on social media platforms like Instagram. Use social media platforms like Facebook, Snapchat, and Instagram to create videos that you can share with your audience. Search for a list of real estate media and writers and contribute quotes, etc. You can sign up for HARO (Help a Reporter Out) and respond to press inquiries. You can also pitch to real estate publications or blogs to write a column or contribute an article for them. 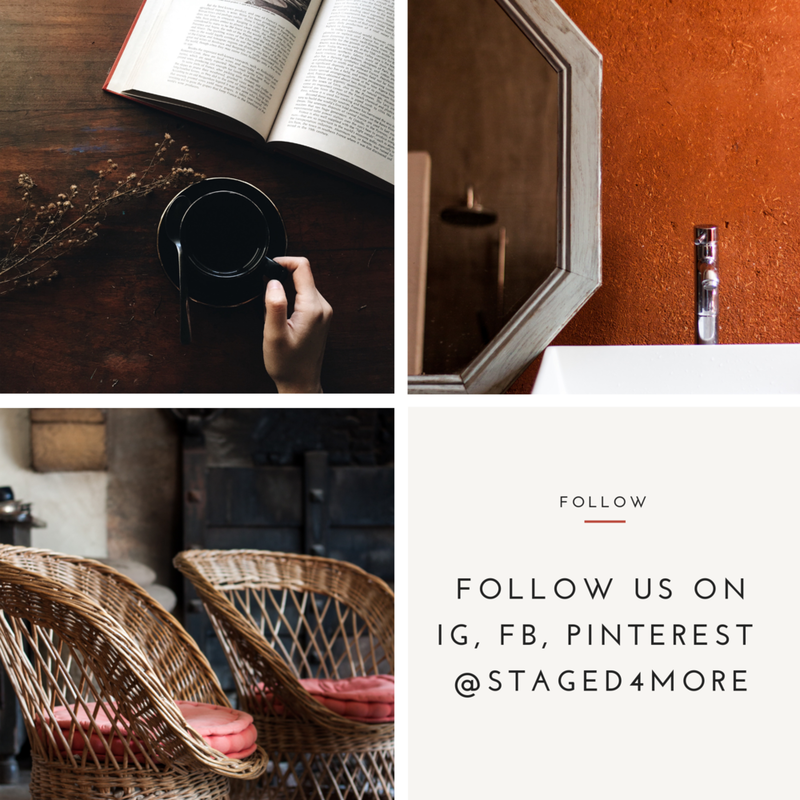 Send your staged home photos to design blogs or magazines to publish. Showcase a client and let them share what it was like working with you and how your staging had changed their listings. Research your competitors: what are they doing well? What are they not doing so well that you can use that as an opportunity for your business? Audit your current marketing strategies to make sure they are generating a decent return on investment. Join online networking groups on Facebook, LinkedIn, etc. and interact with other real estate professionals and network. Know that some income-generating activities are immediate, like calling clients about their outstanding invoices. Some may take some time, like using social media to promote your business. The key is to keep doing whatever the customers are responding well and tweak or change the strategies that are not performing well for your business. Do you have any marketing or income producing strategies to share? Share them in the comments area below.